Last night’s packed Grand Performances at California Plaza was providing plenty of memorable moments. 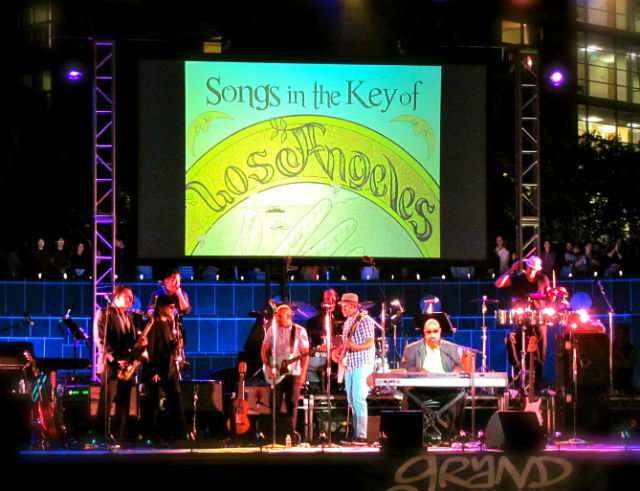 L.A.’s own Ozomatli served as the “house band” to celebrate the Los Angeles Public Library’s exhibit, Songs in the Key of LA, which looks at L.A.’s history through its sheet music archive. And then Stevie Wonder brought it to a whole other level. Grand Performances had commissioned Ozomatli to create new musical arrangements and reimaginings from selected sheet music. During the course of eight months, Ozomatli and their musical guests adapted 11 songs from the Library&apos;s archive, which they played last night along with other L.A.-centric tunes. Writer, exhibit curator and USC Professor Josh Kun served as emcee providing little history lessons on early L.A. music during musician and set changes, which kept the evening moving. But then even more magic happened: Wonder—an unannounced guest performer—stepped onstage to help wrap up the concert. He did a solo performance of “Overjoyed,” which sent chills through the crowd, followed by a rare treat—his funky “Land of La La.” There was a little technical glitch during the performance—but no one in the audience cared. They only wanted the night to last a little longer when Wonder was joined by Ozomatli and the other guest artists for a messy, beautiful rendition of Ozo’s “Como Ves,” which morphed into “La Bamba” with Wonder taking the lead on his harmonica. It was pure magic—and a perfect way to celebrate this crazy city.